Three outlaws ride into the town of Welcome, Arizona on a clear, calm day, planning to rob the local bank. They're not particularly hard men. They're cattle rustlers, used to making money off a few stray cows here and there. This will be their first bank robbery, maybe, their first attempt at something bigger and badder. Not being hard men, they exchange pleasantries and share coffee with a man they meet on the outskirts of town, a man named Buck Sweet (Ward Bond), who turns out to be the local sheriff, the man who will dog these outlaws relentlessly for the next few days of their lives — for some of them, the last days of their lives. John Ford's minimalist Western 3 Godfathers begins with this easygoing introduction, with three friendly, good-natured men passing the time before a robbery with the man who will shortly become their worst enemy. 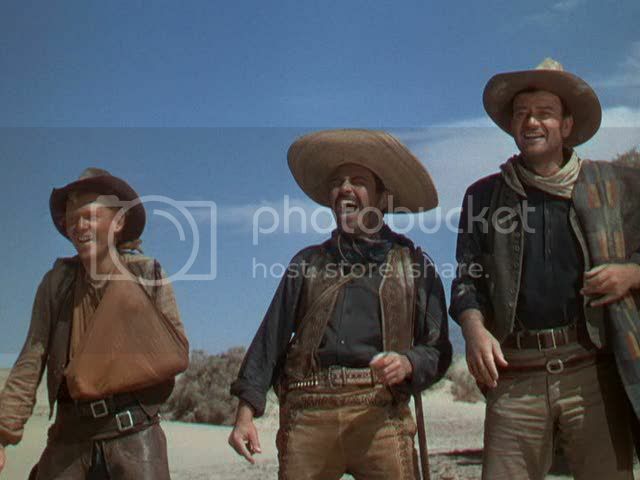 The three outlaws are Robert (John Wayne), William (Harry Carey, Jr.) and Pedro (Pedro Armendáriz), and their first appearance in the film makes it clear that, despite their shiftless ways, they are not bad men, merely misguided, perhaps with few other options available to them besides making money in various dishonest ways. They are sympathetic bandits, driven not by greed but by simple necessity to rob and pillage. Ford introduces these men in an economical, fast-paced prologue, establishing their essential decency and then staging the bank robbery itself as a quick flurry of motion and gunfire, a harsh interruption of the tranquil, friendly atmosphere of this town, which seems to have earned its name as a welcoming place. 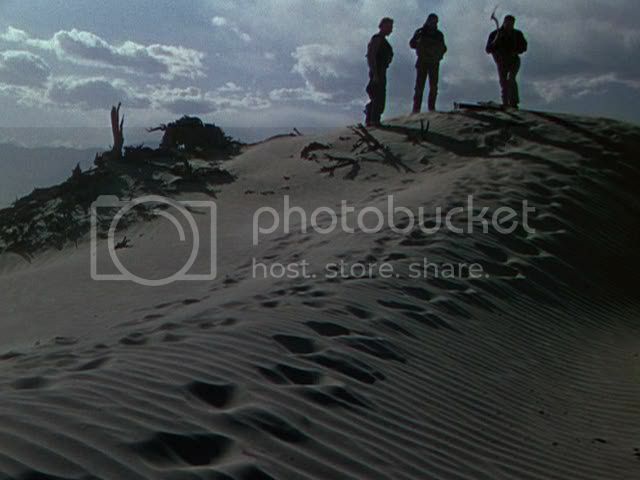 The men then flee into the desert, where they'll wander for the remainder of the movie, hemmed in by the forbiddingly dry, desolate land and the sheriff's posse cutting off both their routes of escape and their access to water. With the sheriff's men staked out by the two closest water supplies, the three bank robbers must make a dangerous trek across the desert towards a more distant water tower where they can slake their thirsts and tend to the worsening bullet wound in William's arm. Ford, always a master of landscape and location, makes the isolation of the desert felt intensely, shooting his three anti-heroes as fuzzy silhouettes within wide shots in which the blank white expanse of the cracked desert hardpan is matched only by the open blue of the sky, a stray fluffy cloud or two scrawled across its surface. Many of Ford's compositions divide the frame horizontally between sand and sky, with the outlaws' staggering forms positioned right at the boundary line, trudging through the sand and pushing forward against high winds and overpowering heat. The film's visual palette is thus simple, in the way that a Mark Rothko painting is simple: an area of pale blue hovering above an area of white, with a hazy horizon line and a few indistinct black blotches separating the two color fields. These stark compositions, like Rothko's, create subtle tensions and resonances between the halves of the frame. Sand and sky both serve to isolate the protagonists within large open spaces. The sheer scope and grandeur of these images suggests spirituality, or at least an understanding of man as insignificant within the scale of the world — let alone the universe. This is why the opening bank robbery is quickly forgotten, and the motivations behind it and the outlaws' other crimes never explained. Those are petty human concerns, and this film quickly positions its protagonists in a setting where concepts like material wealth are increasingly remote. As soon as these men are out in the desert, it doesn't matter that they've made off with a sack full of money, and indeed the money is never mentioned again. The money is perhaps in one of the parcels they shed during their trek, shrugging aside their worldly possessions as these things become too burdensome. As with Rothko, one gets the sense that for Ford, size itself is a signifier of spiritual feeling and philosophical inquiry: the pale expanse of the sky and the salty white ground envelop these men, inescapably confronting them with their own mortality. One begins to suspect that this film, and not the more recent antecedents so often mentioned, is the true predecessor to Gus Van Sant's existential desert movie Gerry. The three outlaws of the title wander endlessly through the desert, trying to reach their amorphous destination, which is at best only a momentary resting place, a way station for them to recover slightly before continuing their flight. But even these uncertain plans are disrupted when the men stumble across a covered wagon abandoned at a water station whose tanks have been drained dry. Inside the wagon, they find a dying woman, pregnant and on the verge of delivering her baby, left behind by an incompetent husband driven half-mad by lack of water. They help her deliver the child, a boy who she names after all three men — Robert William Pedro — and then, before she dies, she exacts a promise from them, a promise to protect her baby, to take him from the desert and bring him to safety. This is an extraordinary situation, but the three outlaws take this promise very seriously. Despite the constant threat of the posse catching up to them, and the desperate lack of water and food, they are determined to bring this child safely out of the desert. In his quiet way, Ford completely shifts the driving force of the movie: the men are no longer trying to escape themselves, but only trying to help this baby survive, even if it means forgoing water for themselves completely, even if it means that some of them will not survive the journey across the desert. Ford never makes a big deal of it, but finding this baby is a moment of redemption for these men, the moment at which they cease caring about themselves and start caring about the pure, innocent fledgling life they hold in their arms. There's no sudden shift, no hesitation, because these are three decent men to begin with; being charged with the care of this baby simply reminds them of their inherent decency, redeeming them from their outlaw lives. In the latter half of the film, their journey increasingly takes on Biblical overtones, reflecting the journey of the three wise men to visit the baby Jesus on his birth. That the film's denouement takes place on Christmas is only the most obvious of the parallels between the stories, though this heavy-handed symbolism merely makes explicit the themes and ideas already apparent in the film's more subtle moments. At the same time, Ford's treatment of these symbolic religious elements gives the film's final act a kind of sentimental poetic spirit, embodied in the broad emotional strokes of the climax, which subverts traditional Western ideals and denies the lawman his cathartic showdown with the last outlaw standing. Instead, the ending is a moving affirmation of family bonds and community, providing John Wayne's Robert with a much more optimistic resolution than the one he'd receive as Ethan Edwards a few years later in The Searchers, another film that ends with Wayne's character returning a child to its proper family. Ford holds out the hope of redemption to his characters, the idea that one can re-embrace society and family and spirituality after stumbling off the path. This is a warm, moving, often even humorous film, inflected with patches of folksy comedy to offset its bleak, deadly landscapes. Painting with the earth tone palette of the desert, Ford composed a large-scale tribute to spiritual redemption and determination. Wayne deserves credit here for one of his last really vulnerable performances. His delirious plod through the desert with the baby and his ravings at the ghosts of his friends is a powerful darkest-before-the-dawn moment. Very true, Samuel, Wayne is great in this. From the laidback dude at the beginning of the film he's slowly driven to a place of darkness and hopelessness, stumbling across the desert. He can be a much more expressive actor than people give him credit for. And also funny: his facial expressions when he's first trying to take care of the baby are priceless. Ed - It is clear from the number of well-written reviews of Westerns on your site that you love Westerns. I have always loved Westerns. 3 Godfathers is a wonderful, less well-known Ford/Wayne Western. The desert landscape is used dramatically. Meanwhile, I am continuing my Western viewings at home. I just finished Buchanan Rides Alone, which seemed silly in the beginning but which I really enjoyed. I like the theme of the dysfunctional town - like the town in Eastwood's Unforgiven. I also re-watched Yellow Sky and posted a brief piece on it on my site. Thanks, Hokahey. I do have a special love for the Western genre. I think its well-defined conventions often encouraged directors to experiment within its framework. And the genre's natural inclination towards beautiful outdoor locations means that some of the most visually striking Hollywood films of the 50s were Westerns, including many of Ford's, obviously. Buchanan is great fun, a hilarious and very uncharacteristic take on the genre. I still need to see Yellow Sky, too, it sounded and looked great from your article about it. you are quit right in linking 3 Godfathers with Gerry from Van Sant; but i think that in Ford's movie the desert is the place where the "godfathers" get redemption through physical pain while at Gerry, they only get physical pain; besides the existencial point, there is a reason for the journey of the godfathers and, at some point, physical pain is justified; at this point, Van Sant's film seems more fetishistic about pain than any other thing. Thanks for the comment. Good point about the differences between the 2 movies; Van Sant's is certainly darker and bleaker in its outcome, though both use landscape in similar ways. I don't agree that Van Sant's film is just pain fetishism, though. Van Sant's landscapes are as much interior and psychological as they are physical.